Thunder claps, lightning strikes, and rain begins to fall as Jane and Margaret approach the bus stop. They are two students: one a model child with good grades, the other a bit of a misfit who doesn’t clean her room or get her homework done on time. But as an ordinary autumn rain turns into a natural disaster, the issue what kind of people we’ll really need in the future is called into question in a new way. This is the setting for Rising Water, a play written by Alice Savage for the ESOL classroom that uses the story of flooding in coastal cities as a backdrop to explore family dynamics in a crisis. As the story unfolds, the audience laughs at the familiarity of parent/child bickering and gasps at the increasing danger of a woman and her sick daughter trapped in the upstairs of a flooded house. I felt incredibly lucky to be given the opportunity to teach a course titled English through Theater because it meant that students knew they were going to experience drama—pun intended! The course was open to students in levels 3 – 5 (intermediate and above), and it quickly filled up despite the fact that it was scheduled for Fridays from 9 a.m. to 1 p.m! The 20 students enrolled were from various countries including Vietnam, El Salvador, Haiti, Japan, Congo, Kazakhstan, Pakistan, Mexico, India, and Thailand. This class really helped me. I want to take it again. I took notes during activities and roleplays, and then settled on the idea of doing audition monologues. I wrote a set of ten short monologues, of about a paragraph each in length, to reflect the voices of different peoples’ experiences during Hurricane Harvey (on which Rising Water was based). Then I assigned the monologues to students and put them in practice groups to prepare as a team. In theater, it is essential to create a safe space for practicing different voices, gestures and emotions, so we spent the first part of each class playing theater games. 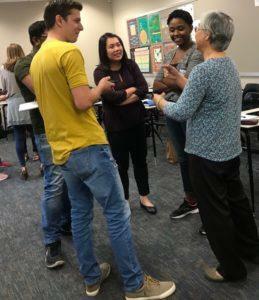 These role-playing, improvisation and guessing games helped students find different registers in English and physically locate the voice of someone who is worried, distracted, upset, happy, or sarcastic. Students performed in a team line up with each speaker taking a turn. Performing with others reduced anxiety, and I was able to focus on individuals’ strengths and weaknesses. This gave me the confidence to assign roles. Because we had more females than males, I changed the genders of the leads for two casts, and those students chose new names. I have to admit that at first, the students just read through their scripts and then drifted onto their phones if I wasn’t with them. However, this did not last once I set a date for the performance because they realized they’d be acting for an audience…Around this time, leaders began to emerge who were able to play a vital role in keeping people on task and even generating new ideas and suggestions. Because we had a four-hour block, I organized the class into a rhythm in which we warmed up with theater games and then moved on to language skills. We variously worked on pragmatics in role-plays, pronunciation drills and activities, and reading and group tasks. During the second half of the class, we had rehearsals. Students broke into groups and read through the play, making notes about their character’s feelings and objectives. As actors they had to look for clues about their characters and reflect on how these clues set up later behavior, e.g., Ajax’s father is just like Ajax, but he doesn’t see it and he gets himself into trouble. I have to admit that at first, the students just read through their scripts and then drifted onto their phones if I wasn’t with them. However, this did not last once I set a date for the performance because they realized they’d be acting for an audience. I also gave them additional assignments such as creating a backstory for their character, designing a program and a poster, and planning costumes. Around this time, leaders began to emerge who were able to play a vital role in keeping people on task and even generating new ideas and suggestions. We continued to work on pronunciation but also on projecting to the back of the room and working out how body language and movements provided a layer to the story that could support the words. One especially useful activity was having each cast move through the scenes without speaking. The actors made their entrances, gestured, and moved around as if they were speaking but they did it silently. As we got closer to showtime, students became more serious about the play. Rehearsal started taking up more class time, and we still needed to do blocking (figuring out where students would make their entrances, stand, sit, and move so that they would not turn their back on the audience). We continued to work on pronunciation but also on projecting to the back of the room and working out how body language and movements provided a layer to the story that could support the words. One especially useful activity was having each cast move through the scenes without speaking. The actors made their entrances, gestured, and moved around as if they were speaking but they did it silently. Those watching could see the story unfold without hearing the words, and I believe this gave them confidence that the story would have emotional resonance. I often invited a few colleagues to come and watch now and then, and this also gave the actors a preview of performing. Then, as in all good theater stories, disaster struck. One student had a work conflict and had to drop out. Someone’s car broke down. Another had a visa problem and disappeared. The week before the performance, one of our most dynamic actors said he had to be at family wedding. “I wish I had known that when I was scheduling the performance!” I said, but there was nothing I could do. The dates were set and the audience had been invited. Because we had three casts, however, other actors were there to play a part twice. One student ended up playing the role of the father in all three performances. Fortunately, he was excellent in the role and had learned all his lines. As we moved into the final days of preparation, I organized a schedule with supporting tasks for people who were not in a particular performance. One student was stationed at the lights. This person turned off the lights between each scene so actors could switch out and arrange the set. Another student did the sound effects, playing a track of thunder and lightning between scenes. A third was a stage manager who sat next to the stage with the script and gave lines when an actor forgot. With these elements in place, students were supported in presenting a 30-minute play with scene changes, props and sound effects. My next to last instruction was, “When you finish, you need to come onstage and do a curtain call. The audience will clap, and you should bow.” Some students had never been to the theater before, so they simply didn’t know. My very last instruction was, “Break a leg!” When some students looked at me quizzically, I had to explain that this is what well-wishers have been saying to actors for hundreds of years. As with athletes, stage performers are comforted by ritual, and it seemed to help. When it was over, and the students bowed, people clapped enthusiastically and swarmed the cast for selfies. It rained on the day of the show, which was perfect for the play. Students came in wearing rain coats and carrying costumes in plastic bags. I traveled the hallways and watched them sitting with their scripts, running lines, walking up and down, and gesturing to the air. It was like being backstage in a real production. They didn’t want my help because they were preparing themselves mentally, so I left them to it. At 10 a.m. the first audience arrived and took their seats in the building’s most spacious classroom. 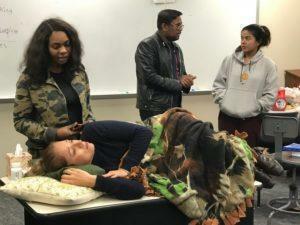 There were about 20 friends, classmates, family members and teachers for each show, and despite the fact that there was a white board in the background and a minimal set, the student actors performed their play with passion. Perhaps there were a few scenes where the pronunciation was incomprehensible, or an actor forgot his lines, or the characters looped around a bit with the dialog before finding their place and moving on, but each time, they captured the audience’s attention. People watching murmured worriedly when the mother was trapped in the attic with her sick daughter, and they laughed at the smug pride of the science nerd. When it was over, and the students bowed, people clapped enthusiastically and swarmed the cast for selfies. I’ve always thought that short plays would work great in ESL. Thank you for the indepth explanation about the evolution of the course and the tweeking invilved. Loved the article. Glad to hear this was helpful. 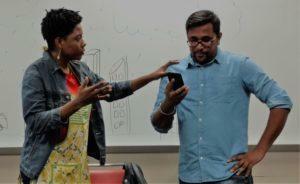 Have you seen our new series of short plays: http://www.alphabetpublishingbooks.com/spel ?